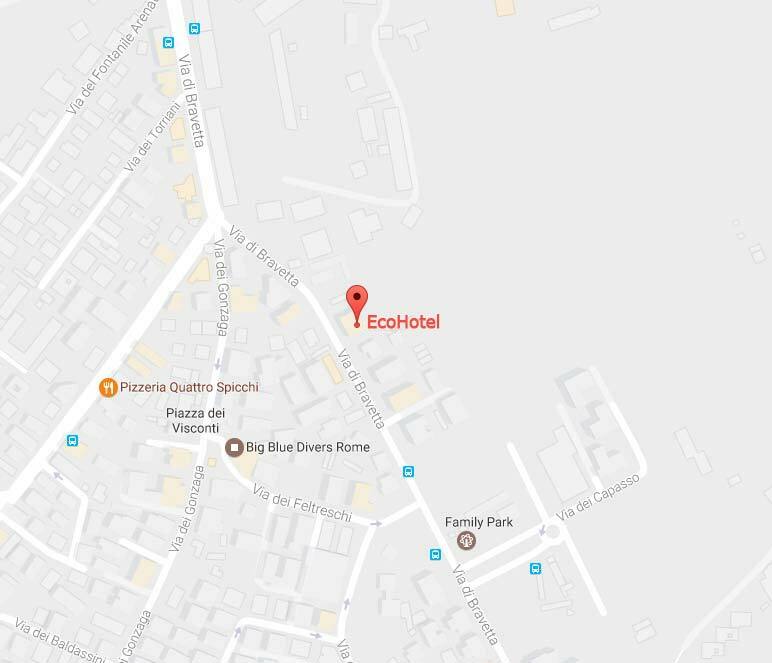 The 3 star EcoHotel Roma is situated in the Valle dei Casali protected nature reserve, a huge green corridor in an urban area of Rome and a few minutes by bus from the Vatican. It is ideal for holiday or business travellers seeking quiet and comfortable accommodation while being within easy reach of Saint Peter's and the city centre, as well as nearby attractions such as the Passeggiata del Gianicolo and the Villa Doria Pamphili. The EcoHotel Roma is served by several buses which stop only 100 metres from the hotel and take passengers either to the nearest metro station in around ten minutes, or all the way to St. Peter's Basilica or the city centre, and the hotel is also just a few minutes' drive from the GRA orbital road. The Fiera di Roma complex can be reached by bus or by car in around 20 minutes. Travellers visiting Rome to attend conventions and trade fairs will be happy to hear that EcoHotel is near to various conference venues, particularly the Ergife and A.ROMA Lifestyle Hotel centres. In addition, several of Rome's main hospitals (San Camillo-Forlanini, San Carlo di Nancy , Bambin Gesù and San Raffaele) can be reached easily and quickly by bus or car. EcoHotel provides a free shuttle service for guests, taking them to the Cornelia stop on metro line A in just a few minutes, and the city centre (5 pick-up points available). For timetables (morning and afternoon) and further information, please ask at Reception. Take the Fiumicino-Roma motorway as far as the exit for the GRA (orbital road) towards Aurelia. Take exit number 1 off the GRA, towards Aurelia Centro / Aurelio-Città del Vaticano. Follow Via Aurelia as far as Largo Perassi and turn right on Via Aurelia Antica. After approximately 1 km, turn right at the traffic lights into Via di Bravetta, and follow the road to number 91 (on the left-hand side). Take exit number 1 off the GRA, towards Aurelia Centro / Aurelio-Città del Vaticano. Take the FR1 Train to Trastevere Station and from there take an H line bus to the terminus in Largo dei Capasso (about 200 metres from the EcoHotel). Take line 98 (direction Mazzacurati), 881 (direction Avanzini), N15 (night bus - direction Mazzacurati) or H line (direction Dei Capasso) and get off at the Bravetta/Gonzaga, Bravetta/Pisana or Bravetta/Dei Capasso stops. The hotel is a few metres from the bus stop. Take the H line bus to the terminus in Largo dei Capasso (about 200 metres from the EcoHotel). Take the metro line A (direction BATTISTINI) for 10 stops. Get off at Cornelia and take the exit for Piazza Irnerio / Via Aurelia. Take the 889 bus (except on Sundays and holidays when it is the 98F). Get off at the Bravetta-Pisana stop. Continue on foot for 50 metres to Via di Bravetta 91. Bus only: Take the H line (direction Largo dei CAPASSO) to the terminus. Get off at the terminus at DEI CAPASSO. Turn right into Via di Bravetta and walk 300 metres to number 91. Metro + Bus: Take the metro line A (direction BATTISTINI) for 10 stops. Get off at Cornelia and take the exit for Piazza Irnerio / Via Aurelia. Take the 889 bus (except on Sundays and holidays when it is the 98F). Get off at the Bravetta-Pisana stop. Continue on foot for 50 metres to Via di Bravetta 91. Take the metro line B to Termini Station, then take metro line A (direction BATTISTINI) for 10 stops. Get off at Cornelia and take the exit for Piazza Irnerio / Via Aurelia. Take the 889 bus (except on Sundays and holidays when it is the 98F). Get off at the Bravetta-Pisana stop. Continue on foot for 50 metres to Via di Bravetta 91.